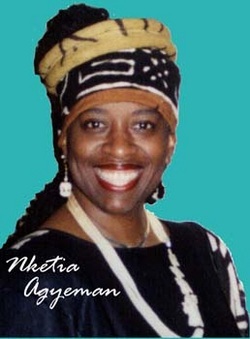 Nketia was born and raised in the Washington metropolitan area. Music has always been a part of my life. With four brothers and one sister, we all had an ear for music, and we all loved to sing. My mother and father always had music playing in our household, first thing in the morning and going to sleep with it at night, as they listened and danced the nights away. If we weren’t listening to gospel or jazz, we were harmonizing to the Harmonizing Four or the Temptations. My sister use to make us practice in the bathroom listening and singing tight harmony. She was serious. Through all grade levels of school, I found myself singing in some type of group or choir. Singing with a company of accomplished vocalists (In Process...) I have found myself displaying a range of highs and lows (through my various moods) that reveal the heart and soul of my love for music. I have been blending voices with In Process... for 17 years. The In Process... space, be it rehearsals or concerts always renders itself a comfort zone for the sisterhood that we all share. The harmonical, rhythmic talents of each one of us blending our voices and personalities definitely displays the maturity and self confidence that each one of us has developed since the birth of In Process... twenty years ago.